About: Philippe Herard is a French artist, who became famous after creating innumerable urban interventions around the 19th and 20th districts of Paris, where he is based for more than 25 years. The stories Hérard pastes up on walls in the street are those of faceless figures placed in absurd or uncomfortable situations. His work quickly becomes familiar to passersby, with its earth toned palette and symbolic elements: buoys, ladders and planets. With his images he creates a melancholic and helpless atmosphere. The French painter and figurative artist Jean Rustin is his biggest influence. The brown tint of the craft paper used by Hérard blends in to the color of many Parisian walls. His “gugusses” (the name he has given to the characters present in almost all his pieces) appear huddled in on themselves, pulled by strings, trapped in buoys, or facing walls. They are often looking away, or facing forward with their faces darkened. All his paintings are titled “cent titres” (phonetically, it can mean ‘without a title’ or ‘one hundred titles’), leaving the interpretation free to all. Initially exposing only in galleries, Hérard became a street artist in 2009. He started pasting his gugusses and buoys in the street, which he painted on craft paper. Apprehensive in the beginning, he quickly discovered that people were taking pictures of his work, posting them online, asking who was the artist and offering various interpretations. Philippe Hérard was exposed to art as a child when, following an accident in which he broke his leg, he was immobilized. One of his great uncles who happened to be a painter visited him during his recovery and initiated him to drawing. Later he studied illustration/design, worked with advertising agencies, until he started to paint full time. Different from most of street artists, Hérard doesn’t travel at all. People paste up his work in other places, they contact him when they’re going abroad, they paste up his work and send him photos of it. Without leaving home, he has his poetic images activating peoples imaginary in many countries. Where you can see it: Specially in the 19th and 20th districts of Paris, but also in São Paulo, other unpredictable places, and even in the fjords of Norway thanks to his friends pasting-up his work around the world. 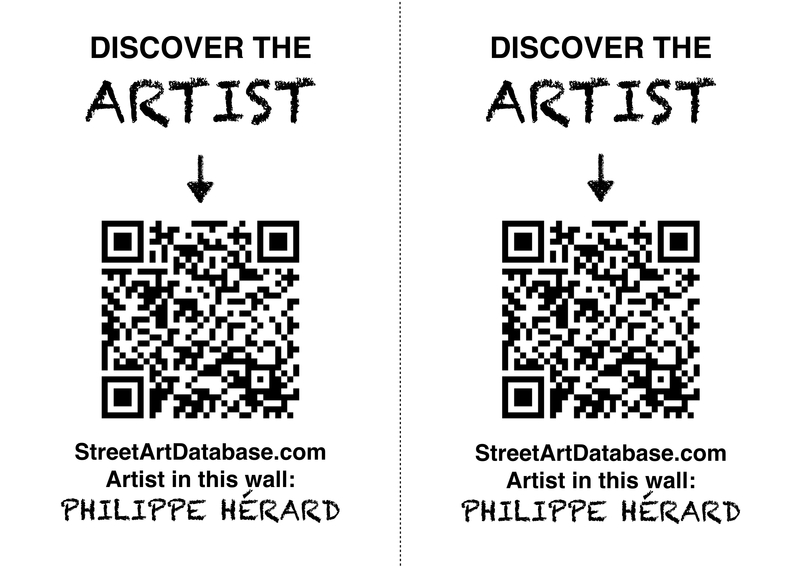 PRINT CODE: help tagging Philippe Hérard in the streets of your city! Posted in poster wheatpastingBookmark the permalink.